Funny how September 1st gets here and all of a sudden Mother Nature decides to bring us the most perfect weather ever. My idea of perfect is warmish in the day time, temps in the 70s, minimal humidity, sunny, and beautiful. Then once the sun starts to set, there is a hint of coolness in the air that is not quite sweatshirt worthy, but a lightweight long sleeved top will leave you perfectly comfy. That's how summers in Michigan used to be. Summers in St. Louis have been that way as well, but there are usually a few days of crazy hot, humid heat mixed in there, too. This summer has been unbearable and the hot humid days were more of the rule instead of the exception. So, while I am not 100% mentally ready for fall, I welcomed to beautiful weather this weekend! The husband thought this was a sweatshirt when he was taking photos of me. Nope, it's a lightweight, super soft, long-sleeved, t-shirt tunic. The gals at The Mint Julep Boutique reached out to me and asked if I wanted to sample a couple of these "slouchies" because they're always a best seller for them. When I saw how easy they looked and how great the colors were, I couldn't resist. Because of their popularity, they're doing something a little bit different this year to build the excitement! They're releasing only a couple of new colors every week! Normally they would open this exclusive product up to the public on Sundays, but they're allowing my readers access to shop these on any day of the week! On top of that, they're normally $48, but during this promotional period, you can snag them for HALF OFF at $24! 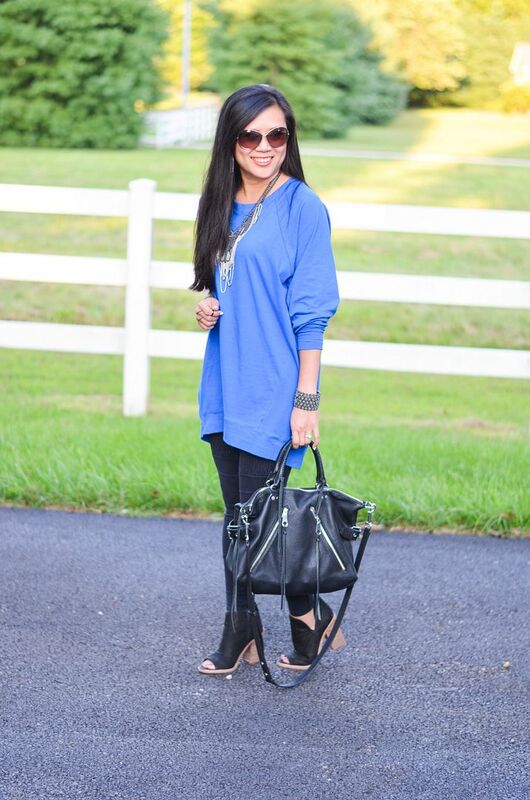 They're dolman sleeved and slouchy, which means they are intended to have a relaxed fit, so size down if you can. I am wearing a small. 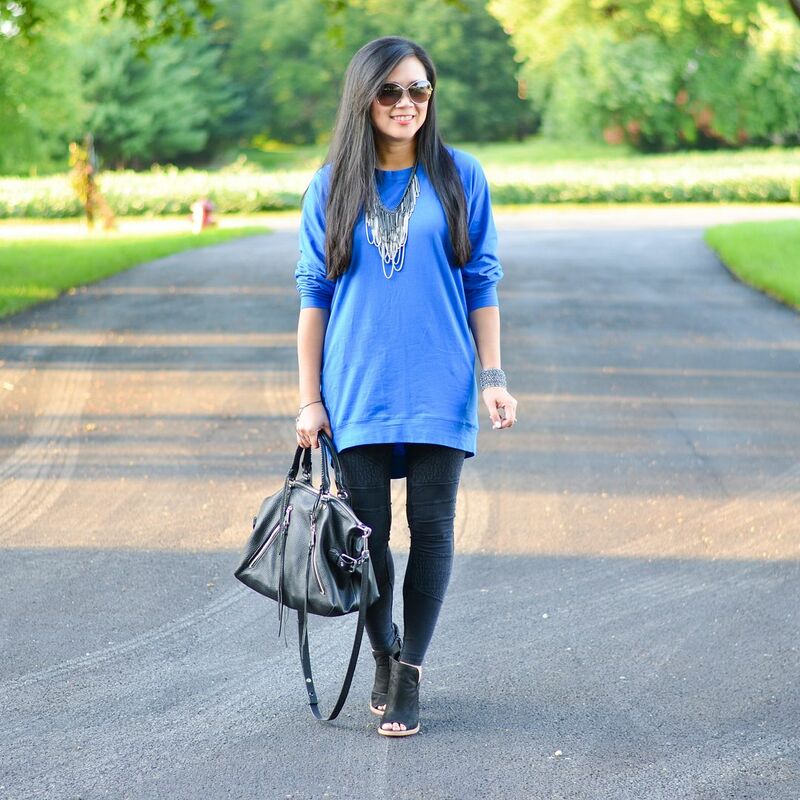 I love that these tunics are a blank canvas to any kind of accessories and shoes you want to pair with it. Dress it up or dress it down. I decided to add some edge to this gorgeous cobalt version by adding some moto accents and tough jewelry. 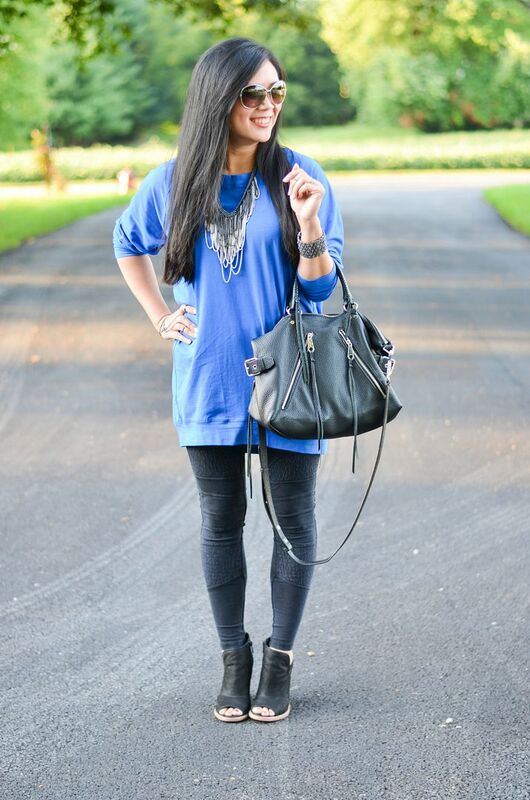 I loved how this heavier necklace grounds the overall look while adding interest and breaking up the sea of blue. This outfit was perfect for a late dinner and cocktails with the husband over the weekend. I think any kind of pointy toed pump would have worked just as well! The cut outs in the booties are too fun though, and since the overall vibe of the outfit felt tough, I leaned towards the booties instead. If you're lucky, you caught my little try on session on Snapchat. I layered a denim jacket over the tunic and threw on some Chucks for a perfectly casual weekend look. I had to share the flat lay version of the more casual outfit so you can see my thoughts on how to dress it down a bit. Jenna and I are leaving for NYC this weekend, and this would make for the perfect airport outfit! I'm not kidding when I say I could live in this tunic. It's so soft with just the right amount of stretch. You may never want to take it off! One more great thing about this slouchie is that since it will be available in a wide array of colors, surely you can find one that will be perfect for tailgating or just showing your team spirit! You can imagine my excitement when I found out the two colors that were being released during my posting period were cobalt and this red and grey colorblock! IT WAS MEANT TO BE, FOLKS!!!! 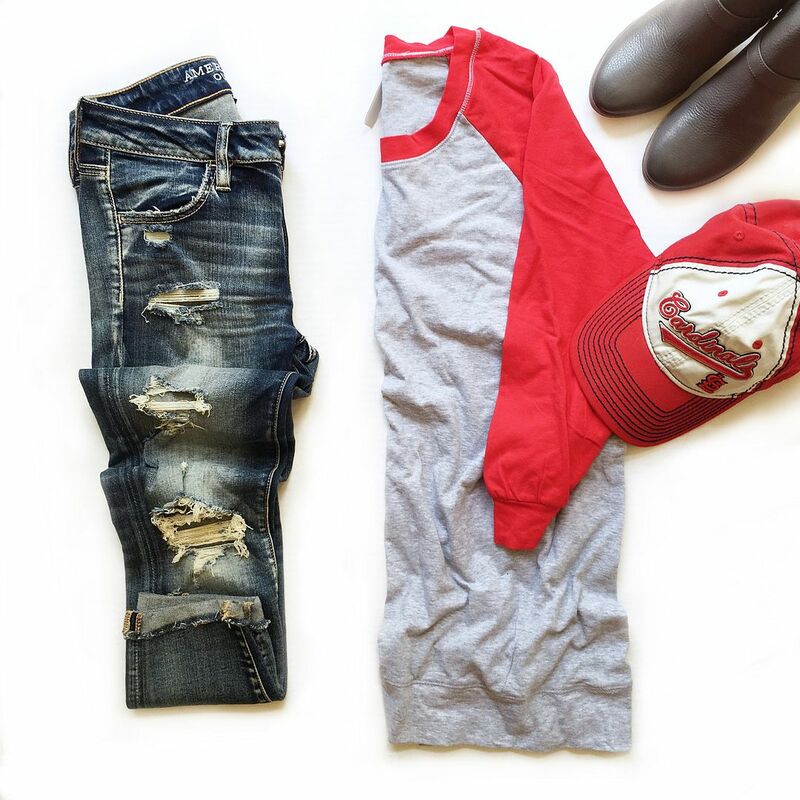 Baseball season always starts cool and ends cool, so I cannot wait to cheer on my red birds in this perfect, transitional piece! I hope you'll take advantage of this great deal! You can always check out their latest new releases by clicking HERE. Thanks to The Mint Julep Boutique for sponsoring this post. As always, all thoughts and opinions are my own! 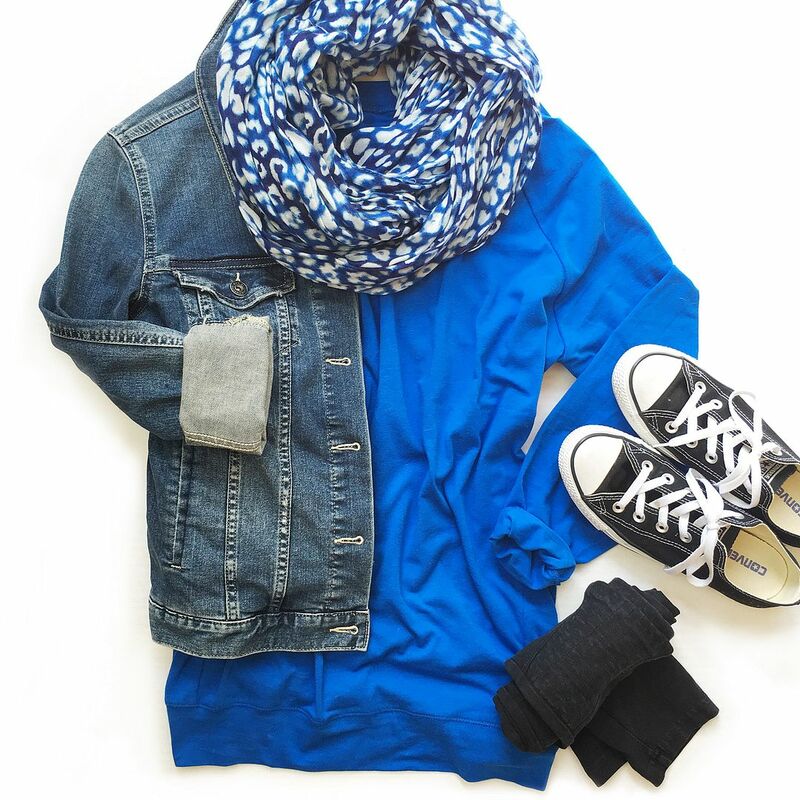 This top looks so cute and comfy, love the color on you! 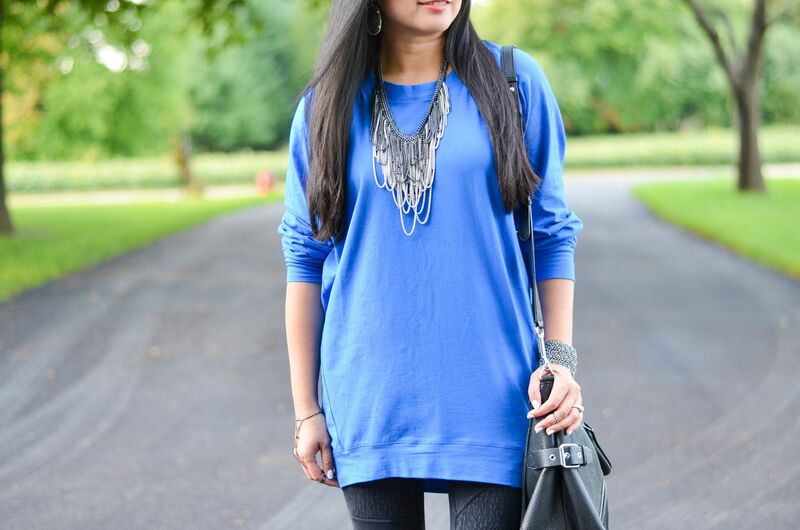 Ah, that tunic looks very cute and comfy! 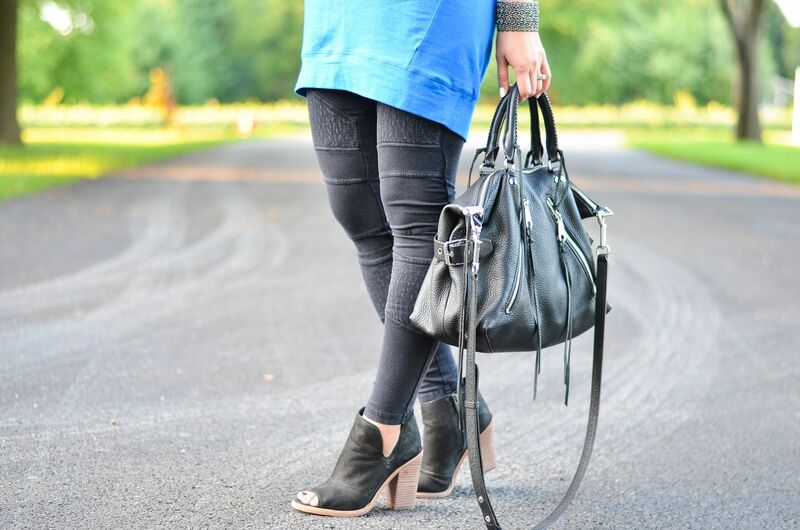 I love how you styled it with the jeans and peep toe booties. And that satchel is always one of my favorites! This looks soooo comfortable! I need it for my trip this week! OMG that tunic looks amazing!! So cozy and cute! I'm so excited for tunics + leggings, yes ma'am. Love this pretty blue on you! Ah yes, the perfect weather! Ours was exactly like you described this holiday weekend and for the first time in months I comfortably wore a lightweight cargo jacket yesterday. I love the color of your tunic! It looks beautiful with your dark hair. And the booties! Soooooo good!